Our neighbor and friend Rebecca DiDomenico organized a fun event for Saturday of Memorial Day Weekend. 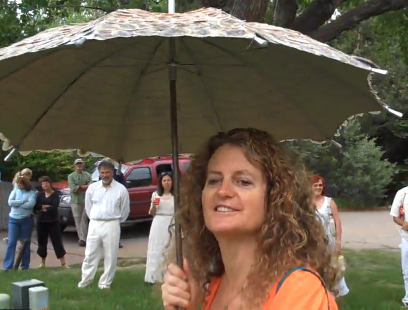 Everyone meets at her house and the first 30 people get umbrellas — works of art, really — made by her and suitable for toting on a walk from 4th Street to Boulder Museum of Contemporary Art downtown. First, Rebecca and friends gave us some instructions for the walk. Then, the group set out — about 50 strong — for the two-mile walk downtown. Festive group, cloudy day, gorgeous umbrellas. Umbrella Walk preparations from Bob Wells on Vimeo. The Umbrella Walk Begins from Bob Wells on Vimeo.